In this episode, we will be exploring the use of a vacuum chamber to dry filament as of lately I have printing more with Bridge Nylon (see more here:amzn.to/2VUnTLK) however this stuff soaks up water like a sponge! 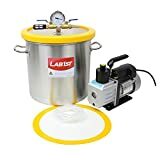 Now I did my home work and came with an affordable 5 gallon unit (see more here: diy3dtech.com/5-gallon-vacuum-chamber-and-3-cfm-single-stage-pump-for-filament-drying/) which I can load with a number of spools at once! Notes: The inset is where I place 24 grams of tap water into the chamber and draw a vacuum in the high 29’s (the meter is hard to read in small fractions) and in 10 min 1 gram of water boiled off which is about what we will need. Second is I am changing my mind reading desiccant and will cover that in Part 2! ← Design Talk – Amazingly Simple Scale Guides!